Discount available! Recommend converter USB-SERIAL 3.3V-5V to your friends and get your Discount. 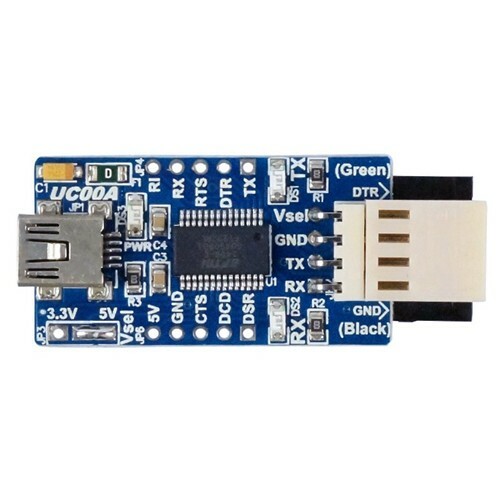 Converter from USB to UART based on FTDI Chip FT232RL. It has 6-pin connector (DTR, RX, TX, VSEL, CTS and GND), 4-pin connector (VSEL, GND, TX, RX), three status LEDs (TXD, RXD, power) and bridge to be welded for operation at 3.3V or 5V. The chip pins are also accessible through the side pitches. The drive is powered directly through the USB port. It Supports Window XP, Vista, Win7 (32-bit and 64-bit) and is seen by the computer as Virtual COM port. Particularly suitable for programming the Espress Lite V2.0 card (not included). Dimensions (mm): 50x21x10.